I first saw The Moving Company last year when they created an original work called Come Hell and High Water, based on a William Faulkner novella about the 1927 Mississippi River flood. I found it to be unique and moving and unexpected. 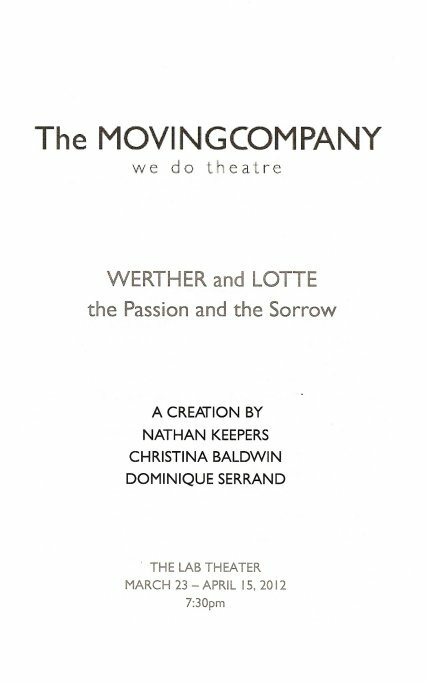 Their new work, Werther and Lotte, reunites two of the actors as well as the director and co-creator of that piece, Dominique Serrand. This one is again based on a novel, set in a specific time and place in history - Johann Wolfgang von Goethe's The Sorrows of Young Werther, set in late 18th century Germany. And it's equally lovely. What I appreciate most about The Moving Company is that they go beyond what we conventionally think of as theater, pushing the boundaries by combining music, images, movement, and ideas. It's truly lovely and a breath of fresh air. Werther is a man on a journey, who meets Lotte (short for Charlotte) and instantly falls in love with her, despite being warned against it. She's engaged to another man, but they still develop a close friendship. When Werther returns after an absence to discover that Lotte has married, he's devastated. The whole play is an exploration of Werther's feelings of being blissfully in love, and finally realizing that it's a love that can never be returned. 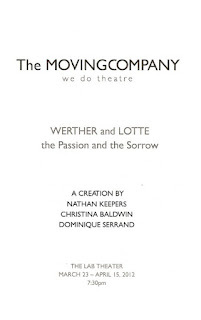 Werther narrates much of the action as the play begins, with Lotte taking over and finishing the tale as Werther's madness overcomes him. Christina Baldwin and Nathan Keepers are the only two actors in the play (other characters are represented by a chair, a jacket, or empty space), and both bring their unique talents to this creation. 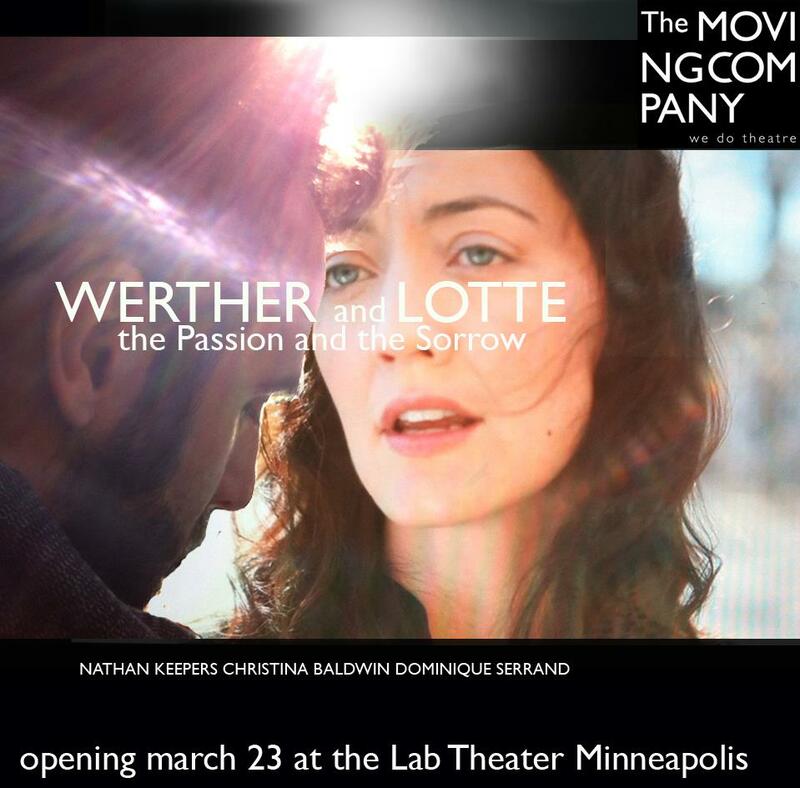 Christina, as Lotte, makes it easy to see why Werther falls in love with her. She radiates lightness and peace and joy, and her voice is, as always, gorgeous, whether she's sing a beautiful French song or a silly little made-up song in German (my name is Werther, poor me, my umbrella is small, I have no potatoes). Nathan has a great physicality in his acting, which he uses here to express Werther's joy and frustrations - climbing on tables and chairs, swinging on a swing, scaling the wall. Both actors have their own unique style and play together very well (I should note that both were involved in creating this piece along with Dominique Serrand). Recorded music mixes with live music in a creative and interesting way, as Edde Hou (violin) and Matt Blake (upright bass) play along with an old phonograph. The costumes (designed by Sonya Berlovitz) are simple but effective. 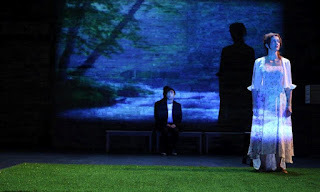 Lotte's clothing changes from light and airy in the beginning of the play, to a darker palette as the play continues and her life gets more difficult. The set is very sparsely populated with a few tables and chairs and some odds and ends, in the beautiful cavernous space that is the Lab Theater. Images are projected onto the brick wall of the theater, of snow, or the woods in the fall, or a babbling brook in spring, bringing nature into this sterile space. The play ends with a beautiful image, after which there was a moment of silence from the audience as the actors came back onstage to take their bows. I think we all knew it was the end, but didn't want it to be! Our work evolves on its feet as we explore how text, physicality, and music intertwine to tell our story. The simple, necessary objects onstage are there, like toys in the sandbox, to spark our imagination and suggest the landscapes of our space. By paring down to the fundamental theatricality of the story, we aim to land the production in a universe which can be in turn surreal, brutal, impassioned, and vulnerable. To that I say - mission accomplished. I highly recommend this show, if only to see an exploration of what theater can be. The show officially opens tonight and runs through April 15.